NASCAR Race Mom: Chase Elliott Finishes P4 at Kansas! 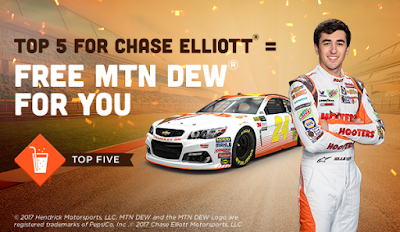 Chase Elliott impressed yet again with a strong P4 finish yesterday at Kansas Speedway! Chase will now move on to the Monster Energy NASCAR Sprint Cup Round of 8 this postseason, and Hooters is looking forward to seeing the work he puts in next weekend at Martinsville. In the meantime, Hooters has free Mountain Dew for Hooters #24 Crew members! Click on the button below to congratulation Chase on Twitter.
.@chaseelliott grabs his tenth top-🖐 finish of the season and advances to the #NASCARPlayoffs Round of 8!